The Hellblade game is owned by the developer Ninja Theory, who also took on the role of the publisher, not entrusting this sensitive question to anyone. And not the whole studio worked on the gaming product itself, but only a small team, in which only 15 people gathered. This toy for the team, which first swung at such a voluminous work, is a kind of experiment. As always happens, the first child most favorite of him nourish, cherish, try to predict every whim. Similarly, in this case, the idea was approached with serious intentions to give out something grand, ambitious and mind blowing at the same time. The authors confess that they have gone deep into the study of all kinds of psychological disorders, kneading them in occultism. Each person has his own little demons living (although for some they are not that small). Working on the image of the main heroine Seuna from the militant Celtic tribe, the developers resorted to the help of various sources for the sake of authenticity. So that the character’s psychological disorder looked natural, they turned to Professor Paul Fletcher, who specializes in neurobiology, for advice. The Welcom Trust, a charity fund famous for medical and scientific research in various fields, also helped greatly. Also, people who once survived psychosis and decided to share their personal experiences made their contribution. This concerned the moments when they heard voices in their heads. Forming replicas of the heroine, the authors decided not to get involved in changing the real options so that everything looked more realistic. V chasing your own monster. 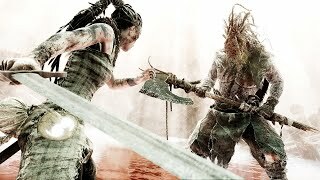 As a result of long and hard work, Seuna was born, becoming what the player sees her, starting to play the game Hellblade. She is obsessed with reaching the bottom of hell to find answers to the questions that torment her. But she doesn’t know that hell is always with her, being a manifestation of her sick imagination. Inflamed brain gives rise to the unknown world of demons, with whom she has to fight. In fact, these are just hallucinations, delusions and terrible illusions caused by the subconscious. Download Hellblade from August 2017, this date is announced as the official launch of the project. From the game shown by the studio, we can say that this is a first-class product with a huge world and ghosts created. Before playing in Hellblade you will probably be interested to learn some interesting details about it. For example, creating a combat system, they invited stunt woman Chloe Bruce, who was the understudy of Daisy Ridley during the filming of Star Wars in the "Force Awakening." 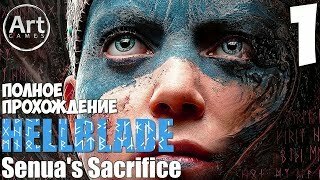 The main role in Hellblade was performed by Melina Yurgens, but in fact she is not an actress, but was engaged in video editing in another project. She performed the role of Senois temporarily while the search for a permanent actress was conducted. However, the team realized that Melina quickly entered the role and does an excellent job, and therefore offered her to continue working through the image to the end. Though the girl agreed, at first she was terribly shy, and sometimes even asked her colleagues to turn away or turn off the lights when she had to perform too emotional scenes. But work on yourself and workouts in the gym gradually instilled confidence in her, and shyness was not so strong.